The MOST horrible news concerns my horror thriller Nightmares trilogy. Any news involving Nightmares is bound to be horrible by definition. 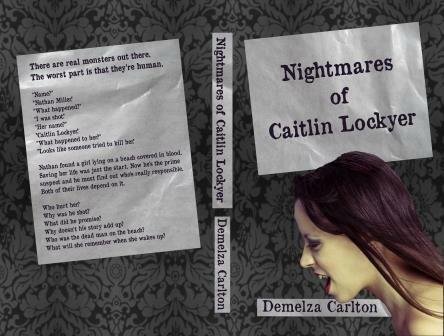 Nightmares of Caitlin Lockyer will be released in paperback on 10th November 2013. The cover has been tweaked to perfection, the formatting teased within an inch of its life…and I think you’ll like the result. The cover I can show you…but the horrors inside are packaged up quite prettily. It’s come a long way from the italics in the draft on Wattpad (which is up to 1.3 million reads to date), while still holding true to its heritage – of being originally written on a mechanical typewriter. The SECOND most horrible news concerns Nathan. It’s always Nathan. Necessary Evil of Nathan Miller will be released in paperback on 27th November. The THIRD most horrible news is that I got so excited, being able to announce the release dates on Halloween, that both Nightmares of Caitlin Lockyer and Necessary Evil of Nathan Miller are on sale until the end of 31st October. Just click on the titles to take you to where they’re on sale. Okay…the news is definitely getting less horrible as I progress. Caitlin’s doctor, Dr Aidan Lannon, has his own story, which will be released in paperback on the 16th November 2013. For those who didn’t know, I’m talking about Water and Fire, my contemporary romance. Stay tuned for more release dates and tour dates in the coming weeks, as I will be venturing out with Caitlin on our first blog tour in November, so I’ll keep you updated with the schedule as I get it. And…I believe I’ll leave it there.